Browse Hikaru Mizusawa Gallery: Recent | Popular. omg!!!! o_o!!!! no!!!!!!!!! I... I... want to add... it to my favs!!!! omg... damn... its so...so pretty!!! onces again very nice choose in scan! where did you find that one?? I just love the chara, clouds, moon, how shes just flying in the air and... and .... what the heck I like everything about this XP XP I WILL fav it when I get the chance u know... used up all my favs... you really improved alot . hope tp see more from you! This wall is fantastic! 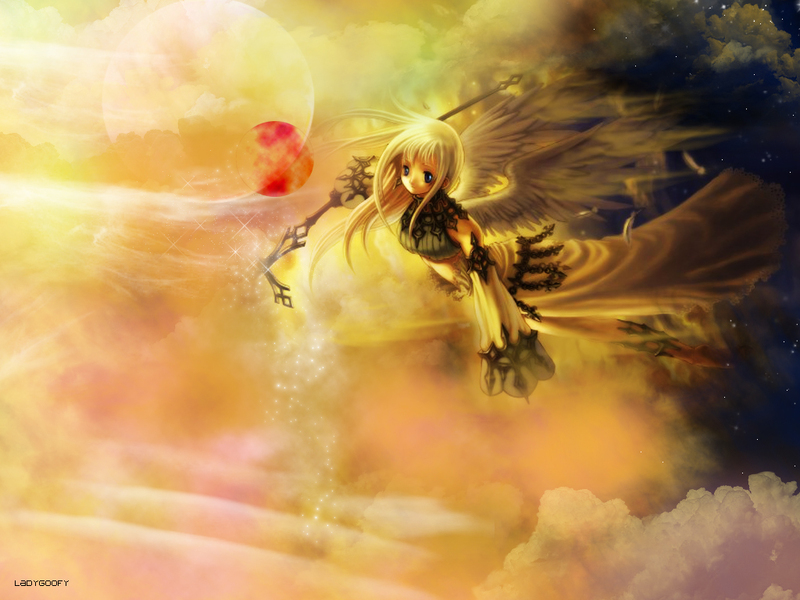 You never cease to amaze me with your clouds ^^ The bright colours on the left side match the girl nicely too! Theres one problem though. The smaller moon(the one with the red and orange) is kind of weird because it's translucent. If you were trying to make the Eclipse effect, I've heard that a circular gradient on a mask works well. i love the effects Lady-G! The effects and ambience fits in perfectly! The breeze effects is soooo cool! I like then red moon too! +favs! It really deserves the spot! The colour transition around the girl from the dark right side to the light left side is well done. Very good job there. Then, there's the fadeout on her wings & dress again between the dark & the light side. Such a beautiful wallpaper. I really like it a lot. The background is fantastic as well. ok i like this one. It's soft and swirlly. (not really a work...) but it has that light to darkness very nicly placed. She looks like she is comeing out of space. I like the softness of the wall. It fits with her and how you blended her to be softer also. Hm, I'll grudgingly admit that this wall is pretty darn good. There are a couple things I feel I should point out though. The first is the red moon-like object has a transparancy setting that allows us to see the moon behind it :sweat: maybe you can blur the lines of the larger moon where they are underneath the red moon to make this less distinct or obvious? this looks so amazing! I'll definately fav this later but since I used up all my favs I can't right now, but wow I love it. hm but i dont know about the red transparent moon. it doesnt seem to blend in with everything else. maybe if it was more faded. Yeah, Fairy likes very much!! great wallpaper, the combination of colors is very good, fits well to the girl too.